There are no influential events or economic reports for USDCHF; only, the US is publishing NAHB Housing Market Index and Foreign Bond Investment. 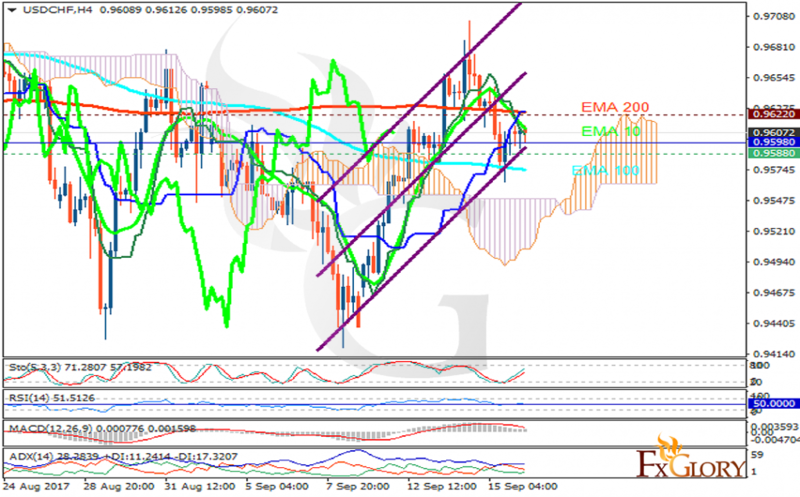 The support rests at 0.95880 with resistance at 0.96220 which the weekly pivot point at 0.95980 is located in between the lines. The EMA of 10 is moving with bearish bias and it is located below the EMA of 200 and above the EMA of 100. The RSI is moving on the 50 level, the MACD indicator is in neutral territory and the Stochastic is showing upward momentum. The ADX is not showing any clear signals. The price is in the Ichimoku Cloud and below the Chinkou Span. The Tenkan-sen is showing a downward trend while the Kijun-sen is showing a horizontal trend. The resistance level breakout will smooth the way for further growth towards 1.009 area otherwise it will drop to 0.9443.